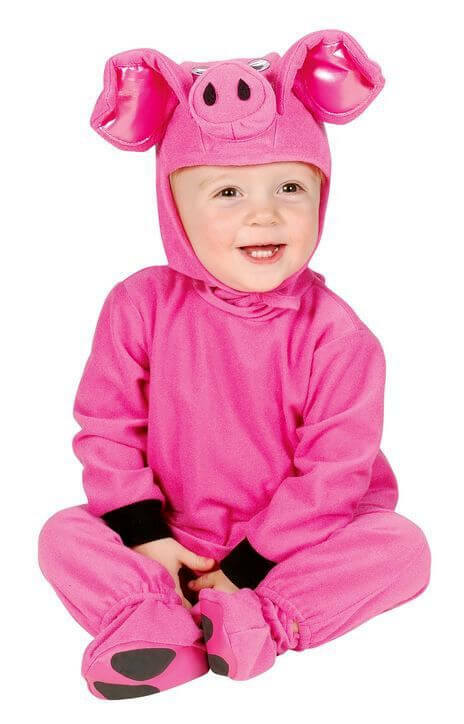 Available Sizes/Colors: Size "Infant (6-18 months)" "Toddler (2-4 years)"
This deluxe infant or toddler size pink piggy costume includes a soft microfiber pink jumpsuit with attached curly pig tail; hood with googly eyes, snout and ears; and pink shoe covers. Jumpsuit has snap tape opening at the bottom for easy diaper changing! Unisex costume is cute for girls or boys! By Charades. 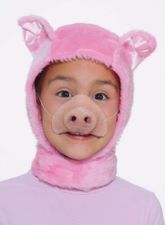 Great for a Three Little Pigs or barnyard animals and farmer family costumes! Note: Our granddaughter Ruby wore this costume for her first Halloween. In the photo below she was 4.5 months old and wore size 3-6 month clothes; she is pictured wearing the size Newborn costume, which was a little too big, more like a 6-9 month size. (You see we had to fold up the sleeves.) 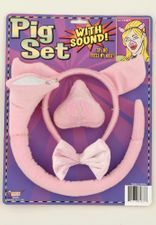 The Toddler 2-4 costume measures 34 inches in the chest and 33 inches from shoulder to ankle.